WLAFCC SigningThe WLAFCC is a voluntary statement of mutual support between a civilian community and its local armed forces community. It is intended to complement the Armed Forces Covenant which outlines the moral obligations between the nation, the government and the armed forces at a local level. The aim of the Community Covenant is to encourage communities, charities, businesses, local government and health care providers to support all our armed forces across West Lothian. This not only includes serving personnel, but also their families and veterans, particularly where they have been injured or bereaved. By doing this we recognise what our armed forces have done for us and continue to do on a daily basis. MoD LogoBy visiting Armed Forces page, you will be able to access information and links to veterans' organisations and the web sites of our three armed services. Very useful for keeping in touch with old cronies! Information imageWe understand that veterans, their families and, in particular, those transitioning from our armed forces need advice, guidance and assistance in accessing services and support. You can find details of the most commonly required services and useful contact details on General Services page. Armed Services Advice Project (ASAP) LogoCAB West Lothian manages the Edinburgh and Lothians Armed Services Advice Project through their regional support team. The project is here to help the Armed Forces Community (AFC) who fall into 4 groups: currently serving, veterans, Immediate families and/ dependants, bereaved. Further information can be found by clicking on the logo to the left which will take you to their website. Alternatively you can contact them at enquiries@cabwestlothian.casonline.org.uk and one of the team will get back to you as quickly as possible. Education ImageWest Lothian College is a key partner of the WLAFCC. Whilst you may not hold the strict qualifications detailed for a course, Armed Forces qualifications and experience are taken into account. The College is highly flexible, and happy to discuss entry criteria. To get in touch, visit West Lothian College website. 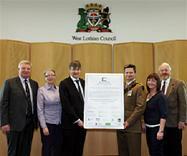 ​The West Lothian Armed Forces Community Covenant was signed on 27 April 2012 by the following nine key partners - clicking a logo will take you to the partner's web site where you can find useful information and points of contact.